Cygnus launches behind the ISS “onramp” road sign at Wallops Island (Credits: NASA). Less than two weeks after Pad 0B reverberated to the roar of the first Minotaur V rocket, carrying NASA’s Lunar Atmosphere and Dust Environment Explorer (LADEE) on its journey to the Moon, the Mid-Atlantic Regional Spaceport (MARS) on Wallops Island, Va., made history again today when Orbital Sciences Corp. successfully launched its first Cygnus cargo ship to the International Space Station. Liftoff of the 133-foot-tall, two-stage Antares rocket—Orbital’s first cryogenic launch vehicle and the largest booster the company has ever built—occurred from neighboring Pad 0A at 10:58 a.m. EDT. The launch was postponed slightly past its 10:50 a.m. target, due to several technical, human, and weather issues. Within 10 minutes of liftoff, the Antares had delivered Cygnus perfectly into orbit, and the spacecraft is currently in the process of unfurling its twin gallium arsenide solar arrays and communications appendages, prior to a rendezvous and berthing with the space station on Saturday. Despite Orbital’s earlier decision to effect a 24-hour launch postponement from Tuesday, 17 September, final processing of Antares and its star payload have run exceptionally smoothly. Two weeks ago, the Dulles, Va.-based company announced its decision to name the first Cygnus in honor of the late G. David Low, a three-time shuttle astronaut and former Orbital executive, whose leadership proved pivotal in securing the COTS partnership. In February 2008, NASA announced that it had selected Orbital—together with Hawthorne, Calif.-based SpaceX—as partners to commercially resupply the ISS. Ten months later, NASA “ordered eight flights valued at about $1.9 billion from Orbital and 12 flights valued at about $1.6 billion from SpaceX.” Under the provisions of the Commercial Resupply Services (CRS) contract, each company was to transport around 44,000 pounds of payloads, equipment, and supplies to the ISS by the end of 2016. SpaceX triumphantly completed its COTS Demonstration Mission back in May 2012, and its first two “dedicated” CRS cargo flights subsequently took place in October 2012 and March 2013. In the meantime, Orbital endured a multitude of technical and organizational problems which repeatedly delayed the maiden voyage of its large Antares launch vehicle. Its Aerojet-developed AJ-26 engines—whose heritage extends back to the Soviet era—are powered by liquid oxygen and rocket-grade kerosene (known as “RP-1″) and are part of a consignment of 36 engines bought from Russia in the mid-1990s. These were extensively upgraded and modernized by Aerojet, and at the instant of liftoff each one produces a sea-level thrust of 338,000 pounds. Despite a handful of problems, including stress corrosion of the 40-year-old metal, the engines have performed generally well on the test stand since 2010. In addition to the engines, Orbital has endeavored to develop a new launch site at MARS on Wallops Island, Va., and experienced difficulties with the construction of new kerosene and liquid oxygen tankage and the certification of propellant loading operations. These conspired to delay the first test launch of Antares well past its original spring 2012 target date. Eventually, on 21 April 2013, the vehicle rocketed away from Pad 0A on the long-awaited “A-ONE” mission and delivered a mass simulator of Cygnus into low-Earth orbit. This provided a close analog for the opening minutes of a “real” ISS mission. By the time of the A-ONE flight, the Cygnus for today’s ORB-D launch was already deep into processing. 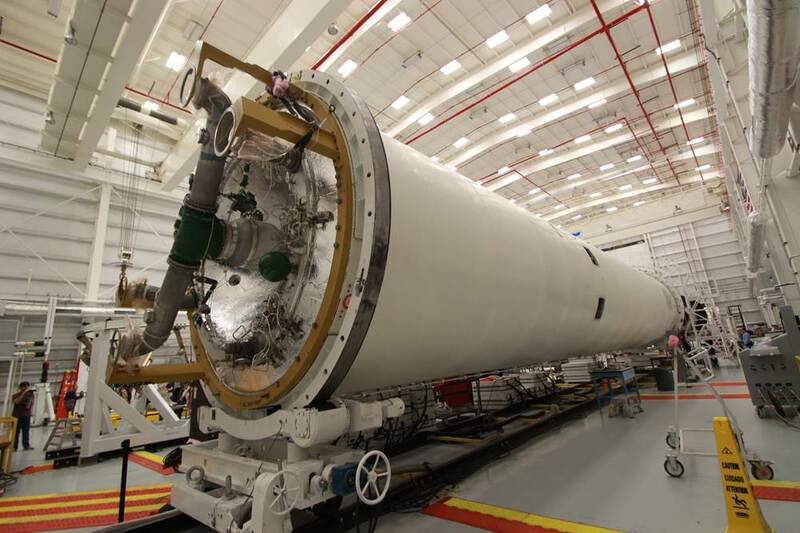 Its Service Module (SM) had been loaded with hydrazine and nitrogen tetroxide maneuvering propellants in the V-55 Hypergolic Fueling Facility at Wallops between 15-19 April, after which it was moved to the Horizontal Integration Facility (HIF) for several months. Meanwhile, elsewhere in the HIF, Antares’ two stages were mated in July and, after the installation of Cygnus, the vehicle was rolled out to Pad 0A on Friday, 13 September. Poor weather conditions during the rollout process and the discovery of an inoperative cable during a combined systems test on Friday evening prompted Orbital to postpone the launch by 24 hours from 17 September until today. A smooth Launch Readiness Review on Tuesday concluded with a unanimous “Go for Launch” and enabled Orbital managers and engineers to begin final preparations for an opening launch attempt at 10:50 a.m. EDT Wednesday, at the start of a 15-minute “window.” In readiness for the attempt, all personnel were cleared from Pad 0A and a process of “chilling down” the Ground Support Equipment (GSE) commenced shortly after 8:00 a.m. “Cooling down of the equipment used to store and transfer the liquid oxygen is important,” noted AmericaSpace’s Launch Tracker, “as the propellant boils at a temperature of -297F and the shock of the supercooled liquid hitting warm valves and lines could cause severe thermal shock and fracture.” Shortly afterwards, Antares’ ordnance—including pyrotechnics to separate various components during the flight—were enabled, and just before 9 a.m. the chilling down of the liquid oxygen transfer lines began, ahead of loading propellants into the first stage tanks. At around 9:30 a.m., a few minutes after the “Go” to commence liquid oxygen loading, Orbital announced a slight shift of the launch time to 10:58 a.m., reportedly to adjust a gaseous nitrogen regulator. Other issues concerned low cloud and “distant focused overpressure,” which led the Wallops Range to declare its status as “Red” (“No Go”), but expected the situation to improve later in the countdown. A group of occupied buildings which may have been exposed to damage by Antares’ blast wave were also evacuated, and a problem was detected with the non-critical RocketCam which would transmit live imagery of the ascent. In the meantime, at 10:13 a.m., Antares’ avionics system was loaded with the flight software to guide its ascent into orbit. Despite the fact that the overpressure issue remained a “Red” item, the Launch Readiness Review declared that it was “Go for Launch” just before 10:30 a.m. The overpressure constraint was finally cleared a few minutes later and the range announced that it was now “Green” (“Go”) for launch. By this point, the fueling procedure was nearing its conclusion. The Antares rocket is rolled out to the launch pad in this NASA image. Rollout occurred on Friday 13 September (Credits: NASA / Orbital). 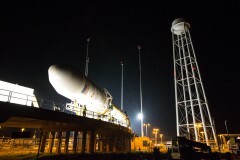 Loading of propellants aboard Antares is timed to begin approximately 90 minutes ahead of liftoff, due to time limits associated with the rapid boil-off of the cryogenics. The loading itself required 75 minutes and was concluded at 10:42 a.m., with all propellant levels declared as “Flight Ready.” The liquid oxygen remained in a so-called “topping-off” mode, being continuously replenished as it boiled off until just before launch. Three minutes later, at 10:45 a.m., a final “Go/No-Go” poll of the launch team produced a definitive “Go for Launch,” after which the systems aboard Antares and Cygnus were transferred from ground power supplies to internal battery power. The Transporter-Erector-Launcher (TEL)—which delivered the vehicle to the pad, raised it to the vertical, and has supported its servicing utilities—was armed to execute a rapid retraction at the instant of liftoff. With five minutes left on the clock, the Flight Termination System was armed, and at T-3 minutes and 30 seconds, the Terminal Count got underway, with Antares’ on-board autosequencer now in primary control of all critical functions. These included the final pressurization of the rocket’s first-stage fuel tanks and the gimbaling of the two AJ-26 engines. Under careful computer control, the engines roared to life at T-2 seconds, ramping up to full power, and the vehicle left Pad 0A at 10:58 a.m.
Orbital is currently processing another Antares rocket for the next Commercial Resupply Services mission, Orb-1, slated to take place this December at the Horizontal Integration Facility at Wallops (Credits: Alan Walters / AmericaSpace). Shortly after clearing the launch complex—with its RocketCam glitch apparently rectified and producing spectacular imagery—Antares executed a pitch and roll program maneuver to establish itself onto the proper flight azimuth. Maximum aerodynamic turbulence—known as “Max Q”—was encountered 80 seconds into the flight, and the AJ-26 engines continued to burn hot and hard until they finally shut down about four minutes after launch. By now at an altitude of almost 70 miles and traveling in excess of 10,000 mph, the first stage separated at 11:01 a.m. This left the second stage and Cygnus to coast for two minutes, prior to jettisoning the bullet-like payload shroud. Ignition of the second stage’s solid-fueled Castor-30A engine came at 11:03:29 a.m. The engine burned with a thrust of 89,000 pounds for about 2.5 minutes, providing a final push to inject Cygnus into low-Earth orbit and shutting down at 11:06 a.m. The cargo ship itself separated from the second stage at 11:08 a.m., just 10 minutes after leaving Virginia. 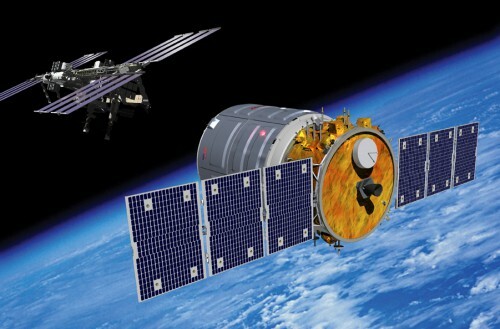 At the time of separation, Cygnus was orbiting high above the Atlantic Ocean, east of Brazil. As described in AmericaSpace’s preview article, today’s launch heralds the start of the month-long Commercial Orbital Transportation Services (COTS) Demonstration Mission to evaluate the ability of Cygnus to deliver a payload of supplies to the station and its Expedition 37 crew of Commander Fyodor Yurchikhin and Flight Engineers Karen Nyberg and Luca Parmitano. Between now and its arrival at the ISS, it will execute several orbit-raising and “phasing” maneuvers to bring it into the vicinity of the multi-national outpost. Despite Orbital’s earlier decision to effect a 24-hour launch postponement from Tuesday, 17 September, the arrival of Cygnus at the ISS remains scheduled for Saturday, 22 September. During rendezvous operations, the spacecraft will showcase its ability to “hold” position at various distances, before entering the Keep-Out Sphere (KOS)—a virtual zone extending about 660 feet around the space station to prevent collisions—and being grappled by the 57-foot-long Canadarm2 robotic arm. It will then be berthed onto the “nadir” (Earth-facing) port of the Harmony node by Nyberg and Parmitano. The Expedition 37 crew will be augmented next week by the arrival of Soyuz TMA-10M with Russian cosmonauts Oleg Kotov and Sergei Ryazansky and NASA astronaut Mike Hopkins, whose first few days aboard the station will be devoted to the unloading of Cygnus’ Pressurized Cargo Module (PCM). Current plans call for Cygnus to remain at the ISS for approximately a month, with unberthing—again via Canadarm2—and separation scheduled for 22 October. Unlike SpaceX’s Dragon cargo ship, which has the capability to return payloads to an ocean splashdown, Orbital’s Cygnus is intended to burn up in the atmosphere during re-entry. 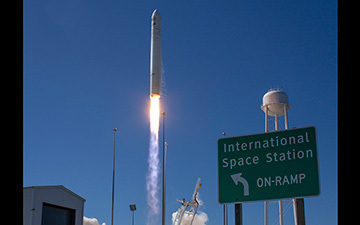 Image Caption: Orbital Sciences Corporation launched the first of the company’s Cygnus spacecraft bound for the International Space Station today, Sept. 18, at 10:58 a.m. EDT from NASA’s Wallops Flight Facility in Virginia (Credits: Jason Rhian / AmericaSpace).